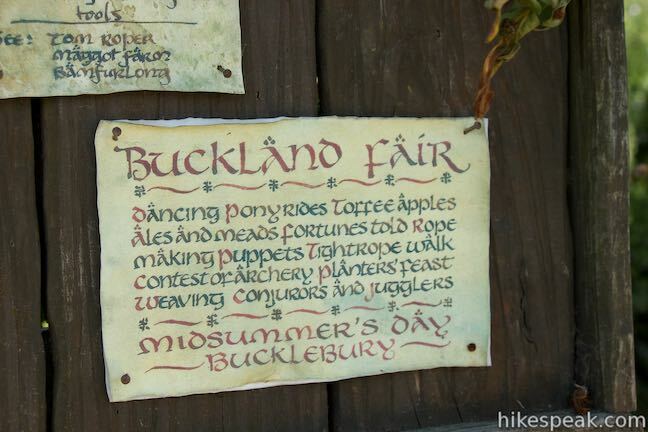 If you ever read J. R. R. Tolkien’s The Lord of the Rings or watched the trilogy directed by Peter Jackson, you probably wished that the peaceful, bucolic land of the hobbits was a real place. 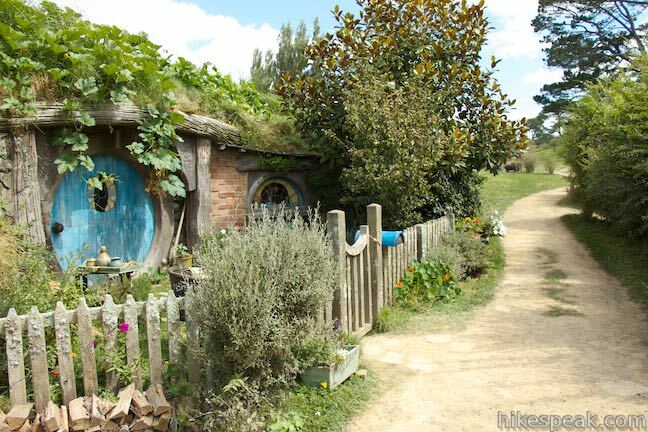 As it turns, the Shire exists and you can go there! 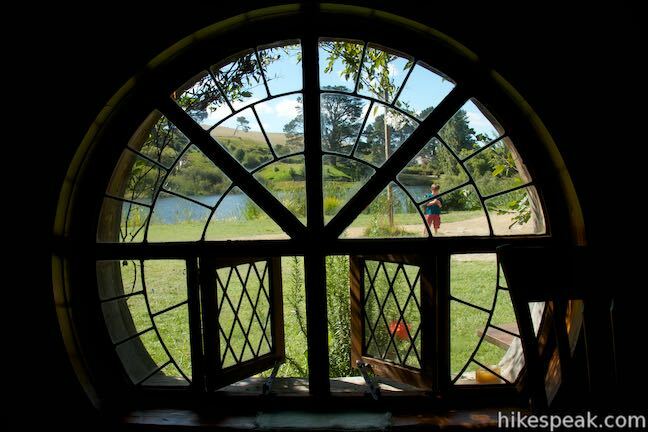 At the Hobbiton Movie Set, you can stroll up to Bag End, drink like a hobbit at the Green Dragon Inn, and walk past hobbit hole after colorful hobbit hole. 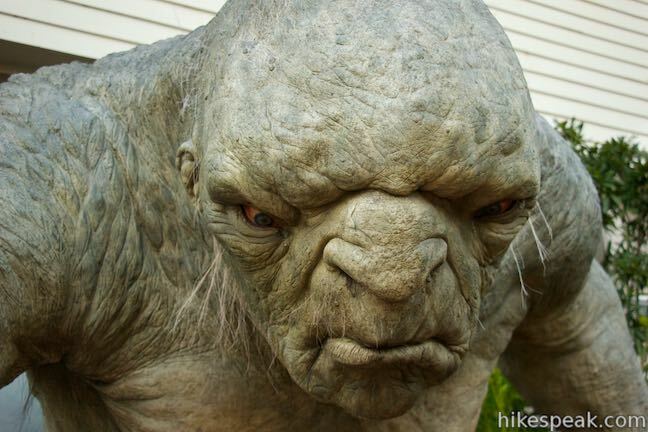 For LOTR fans, it is a fantasy come true. This is the spot where filming took place for The Lord of the Rings and The Hobbit, so it’s easy to imagine yourself in that other world. 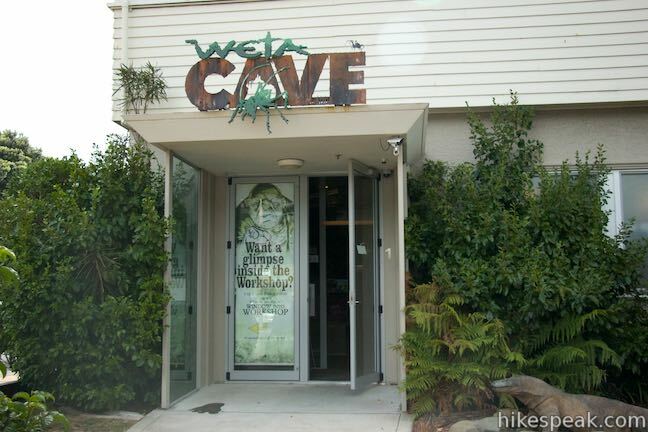 Located near Matamata, New Zealand (a.k.a. 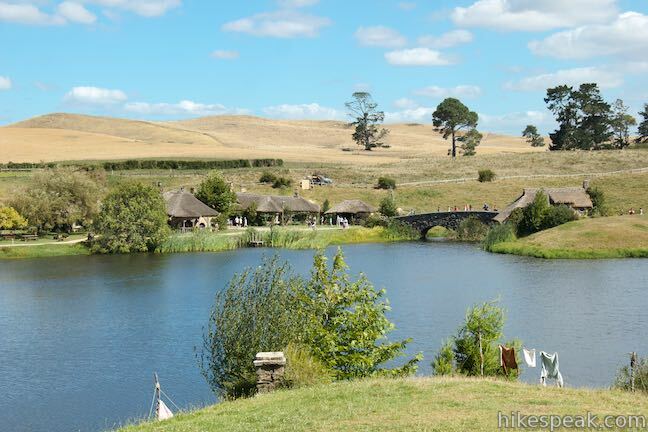 Middle-earth), Hobbiton Movie Set Tourist Farm is a joyful place to visit and should be on the itinerary of any LOTR fan visiting the North Island of New Zealand. 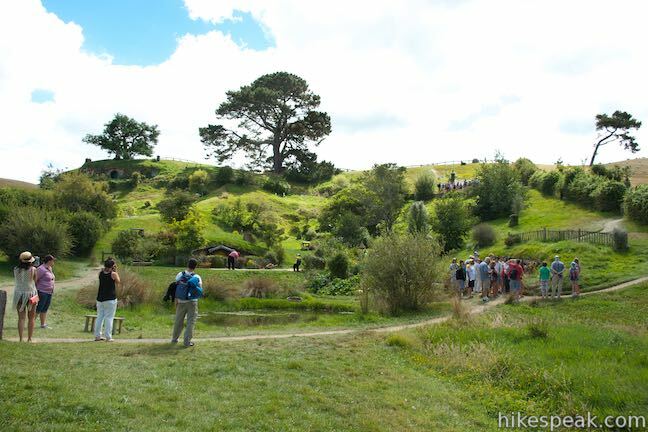 You will walk about 1.6 kilometers (1 mile) on a guided tour through Hobbiton. 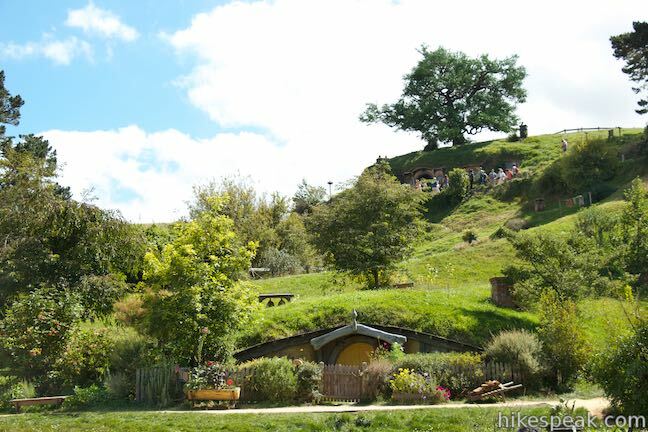 The adventure starts from Shire’s Rest, where there is a gift shop and a cafe. 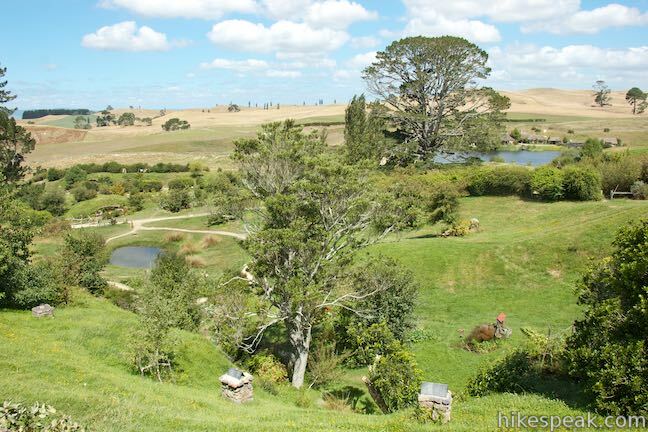 A bus between Shire’s Rest and Hobbiton takes you there and back again. Tours depart every half hour and tickets should definitely be reserve in advance. 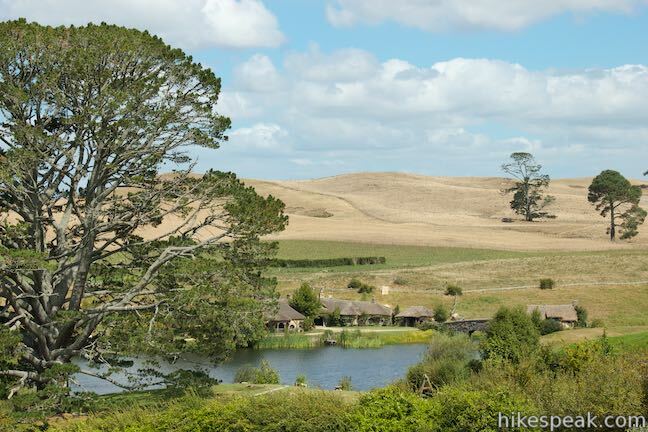 On the 2.75 kilometers long ride from Shire’s Rest to Hobbiton, you’ll pass through Alexander Farm, a 1,250-acre sheep and cattle farm that was selected as the shooting location for Hobbiton in the Lord of the Rings Trilogy. 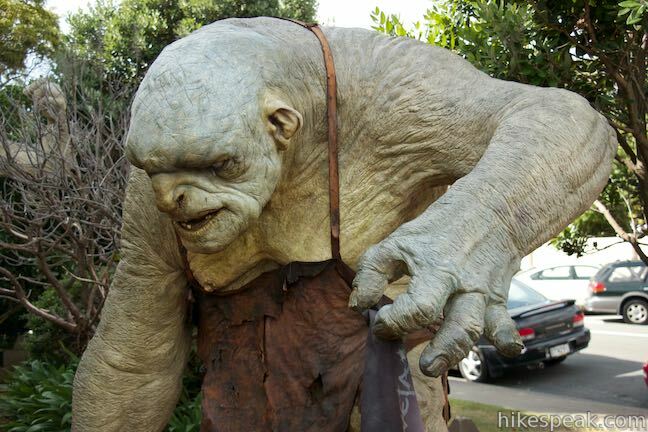 The New Zealand Army built the bus’s road into the shire and provided lots of assistance to Peter Jackson and New Line Cinema so that the trilogy could be filmed in New Zealand. 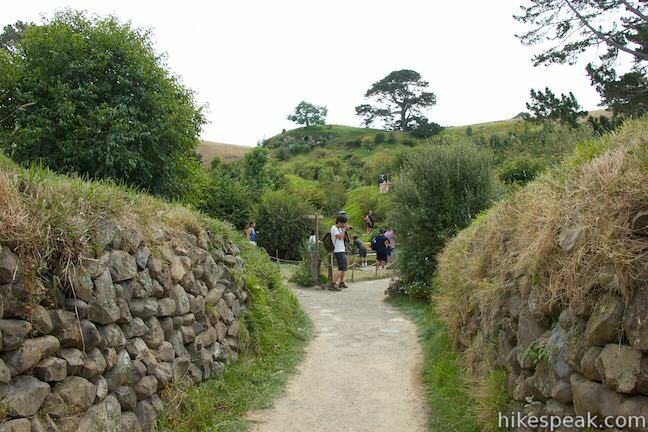 Off the bus, you guide will lead you through “Gandalf’s Cutting.” This is the exact same route that Gandalf takes into the Shire at the beginning of The Fellowship of the Ring when the camera cranes up to introduce moviegoers to the land of the hobbits. 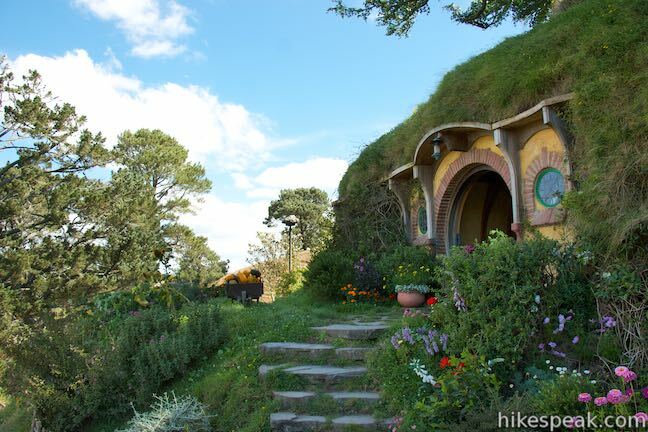 The grassy hillsides filled with hobbit holes are instantly recognizable, including Bag End, which appears on the hillside in front of you. It is a cinematic sight for sure. 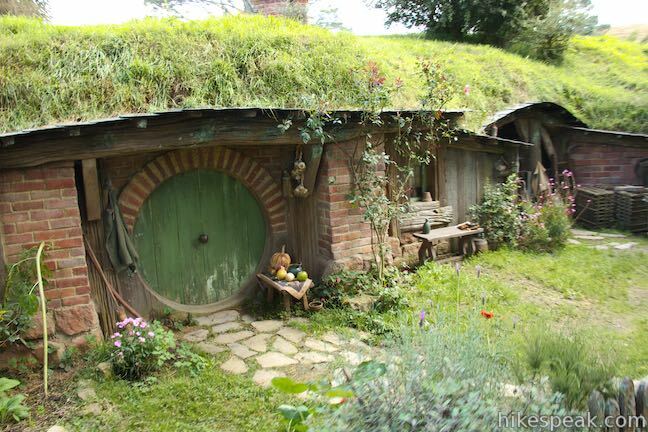 In the films, the shire is busy with little hobbits. 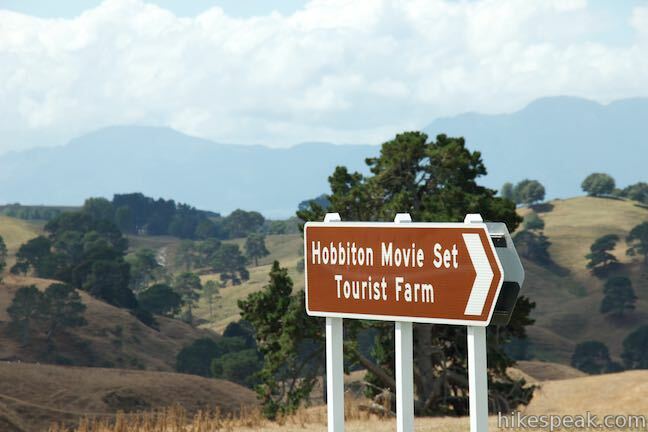 In Hobbiton, tourists mill about instead. 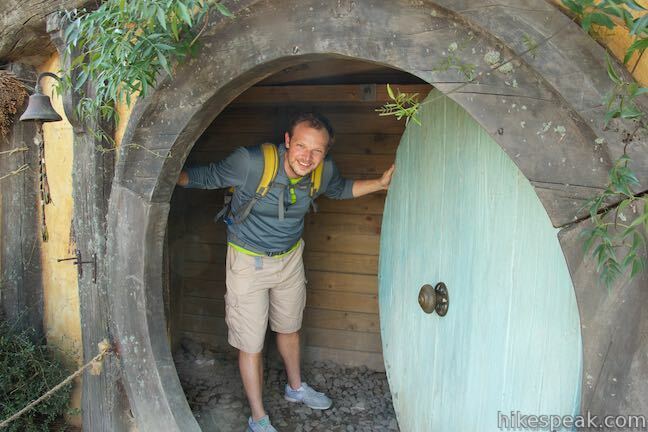 As your guide keeps you on a basic route through Hobbiton and entertains with stories, you are free to wander around between the checkpoints and admire all the highly detailed hobbit holes. 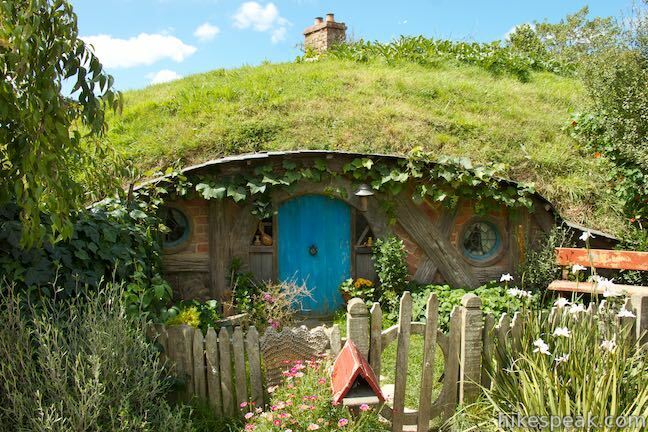 You will quickly notice that some hobbit holes are smaller than others. 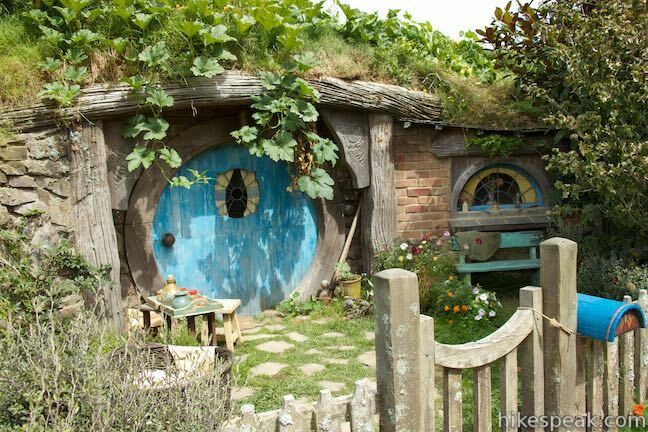 Each hobbit hole was built at 60% or 90% scale to play with perspective and either make the actors playing hobbits look short or make the actors playing men look tall. 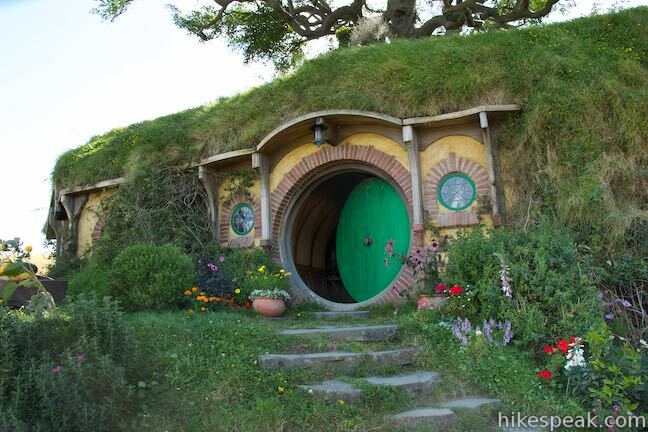 The round doors of the hobbit holes are painted in a variety of colors and built on the sides of grassy mounds. There are chimneys, mailboxes, rocking chairs, picket fences, and other details to bring the area to life. 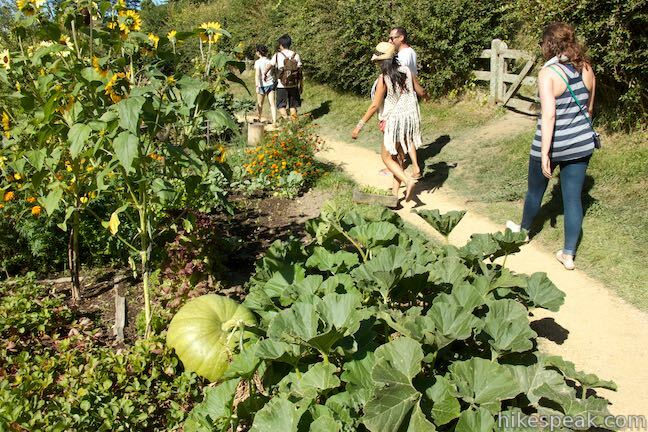 Gardens throughout Hobbiton grow real flowers and vegetables. 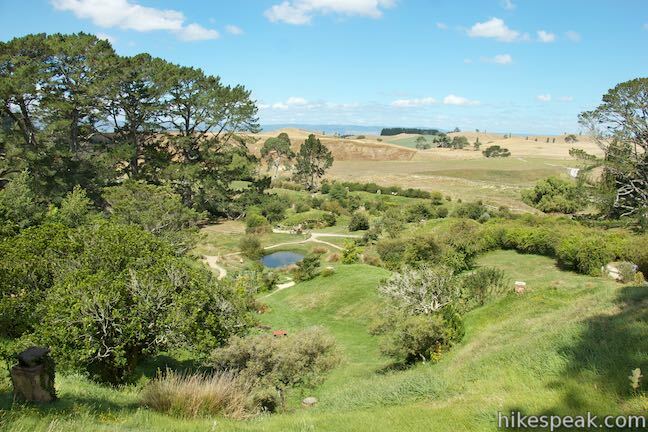 As convincingly realistic as the Shire was on film, it might seem even more real as you walk through Hobbiton. 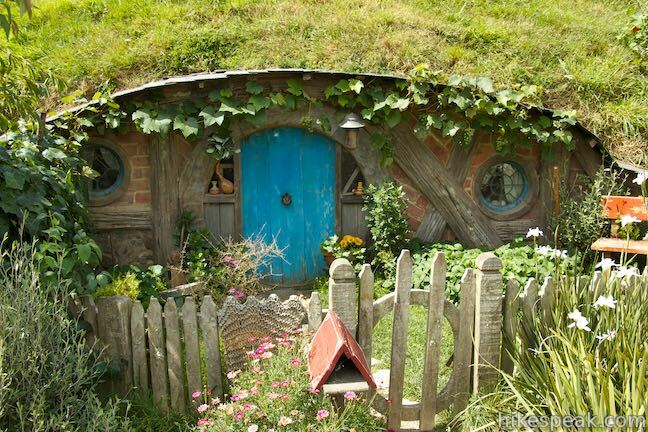 Fourty-four Hobbit holes were created with untreated timber, ply, and polystyrene. 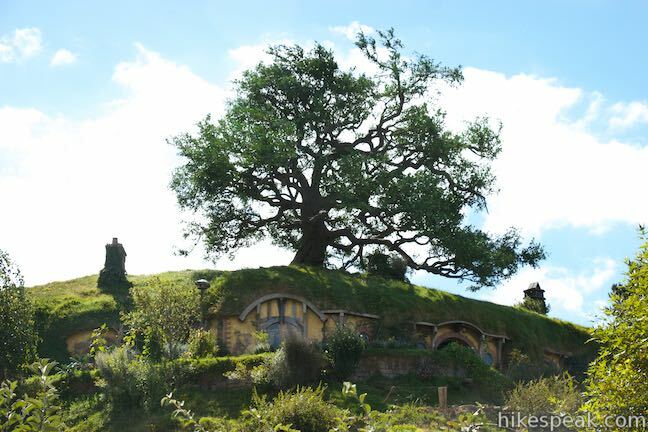 The oak tree that overlooks Bag End was cut down and transported in from near Matamata. Artificial leaves were brought in from Taiwan and individually wired onto the tree. The Mill and double arch bridge were built out of scaffolding, ply, and polystyrene. Thatch for the roofs of The Green Dragon and The Mill were cut from rushes around Alexander farm. 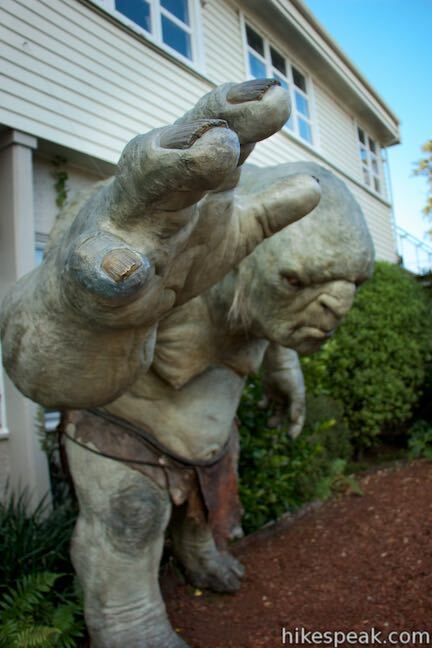 When they were rebuilt for The Hobbit Trilogy in 2009, these structures were built out of permanent materials including an artificial tree, which was made out of steel and silicone. This entire reconstruction process took two years. 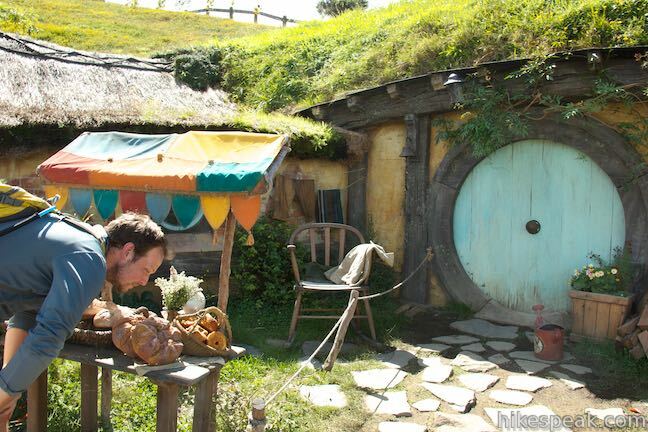 Today, the set is maintained to keep the magic of The Shire alive. 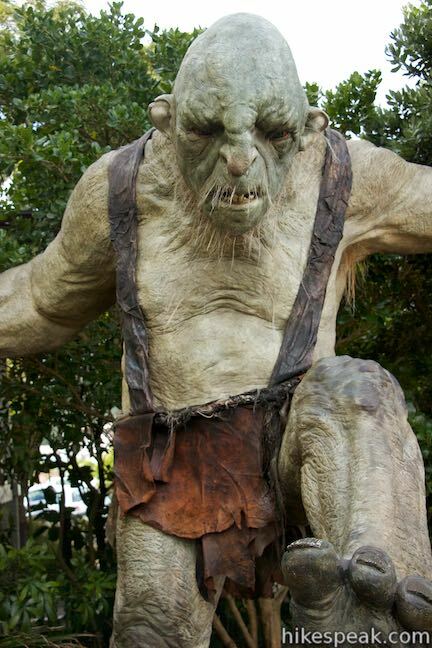 After two years of work, filming for The Hobbit Trilogy lasted only 12 days. Clearly, much of the attention paid in the reconstruction was done for the benefit of today’s tour-goers, and you’ll appreciate it. 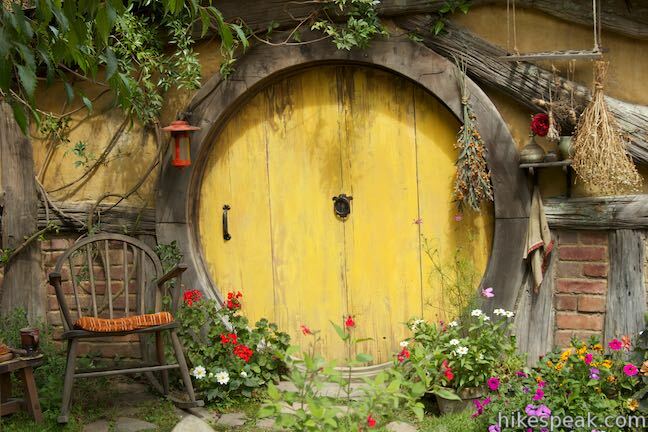 Of course, hobbits don’t actually live behind the round painted doorways (sorry). 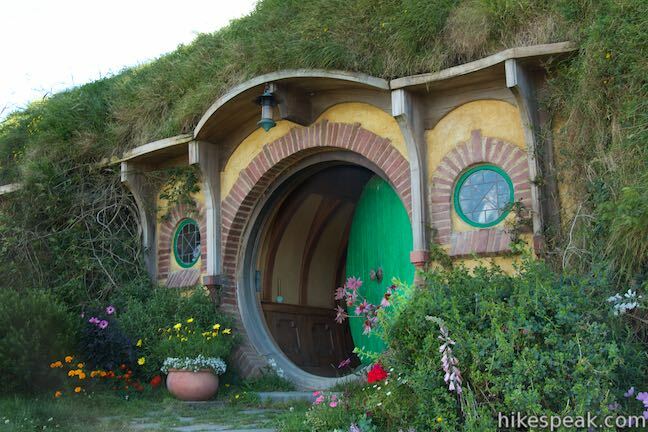 Since Hobbiton was only used to film exteriors, there is nothing behind most of the doors. 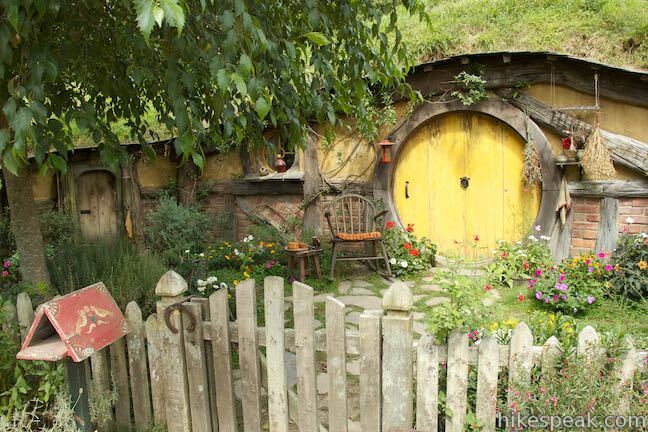 Most scenes inside Bag End (the home of Bilbo and Frodo Baggins) were filmed on a sound stage, but there is enough room inside Hobbiton’s Bag End to accommodate thirty cast and crew members. 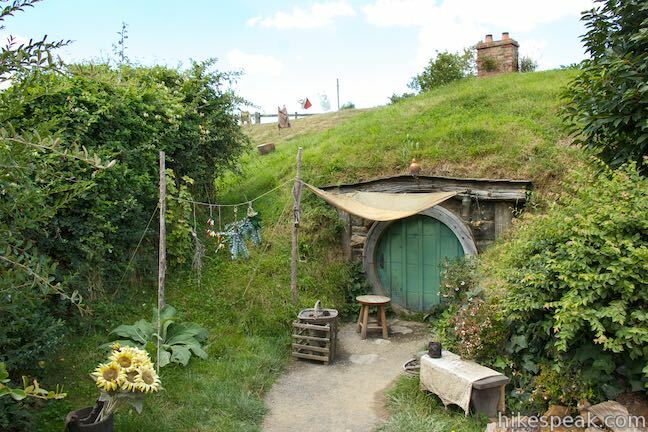 Unfortunately, you won’t be able to step inside Bag End on the tour (because it got damaged too frequently by visitors), but you will be able to step inside the doorways of a couple other hobbit holes. 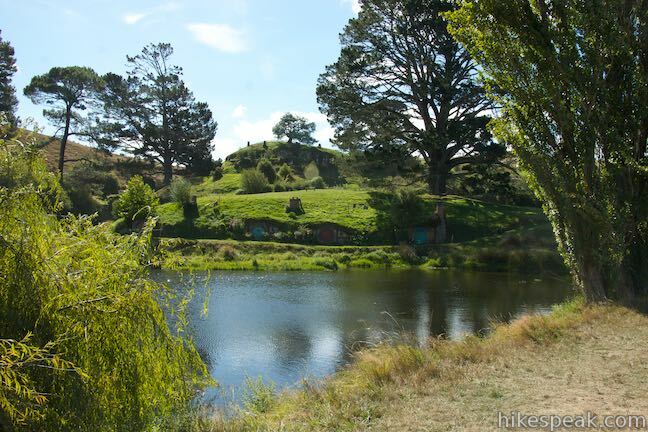 Walk into an area of Hobbiton called the Dell, where there is a small pond wrapped by gardens and several hobbit holes. 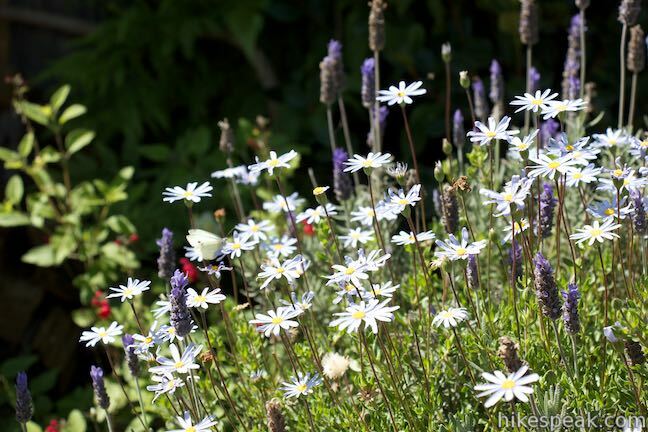 This is a lovely spot where butterflies flutter around blooming flowers. 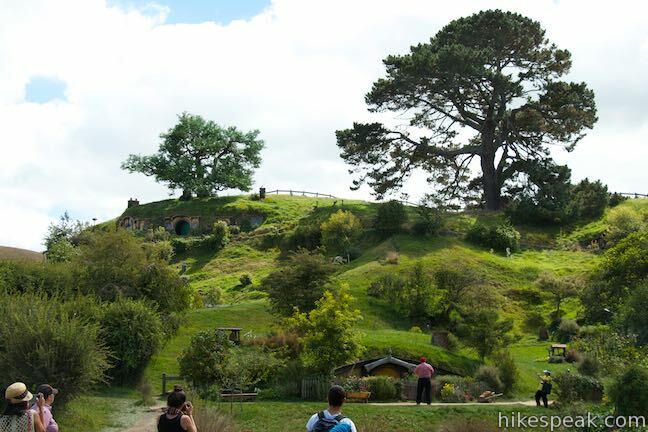 Leaving the Dell, you will begin up a trail on the hillside leading to Bag End. There are a few hobbit holes en route. At the baker’s house, which has a stand of fresh bread outside, you can step inside the open doorway and get your picture taken next to the round turquoise door. 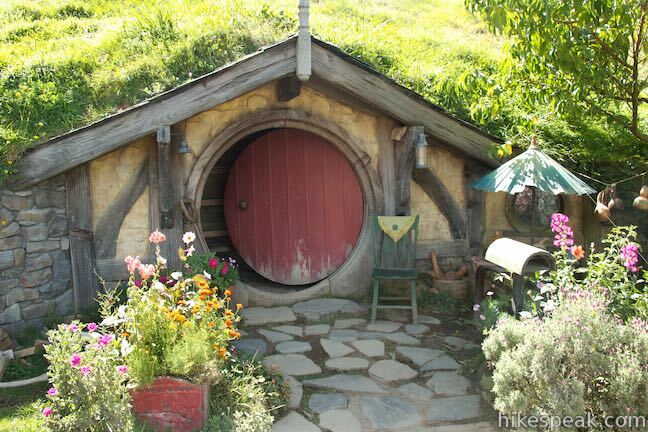 You can do the same at another Hobbit hole as you approach Bag End. 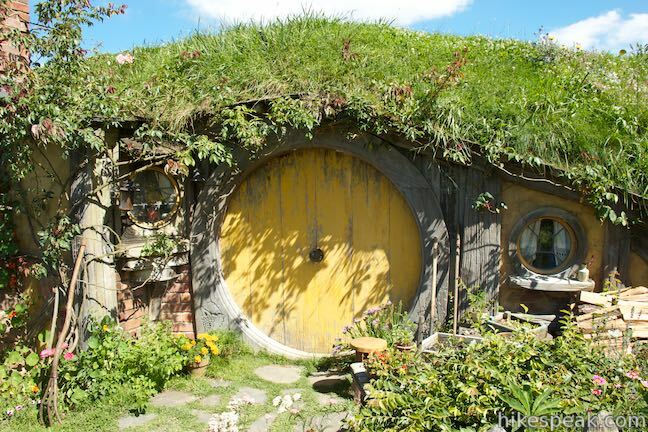 What’s inside these hobbit holes? You’ll have to see for yourself. 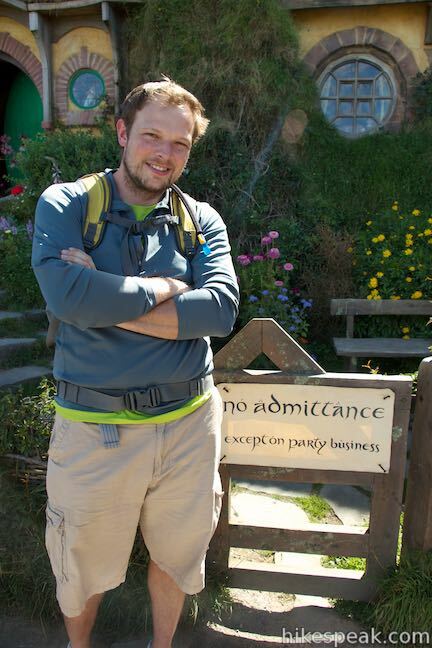 The high point of the tour, both by elevation and significance, is Bag End, the most famous hobbit hole in Hobbiton. 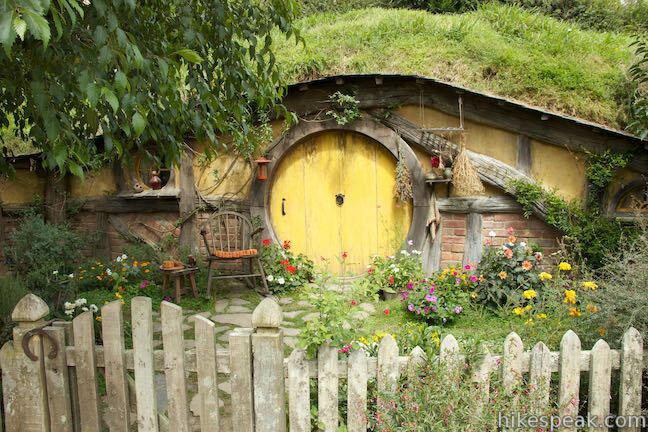 Bag End looks exactly as it should, exactly as it did in the movies. A tall tree stands overhead (this one is actually entirely artificial, although you might not know it if you weren’t told. Flowers line the stone steps up to the iconic round green door. 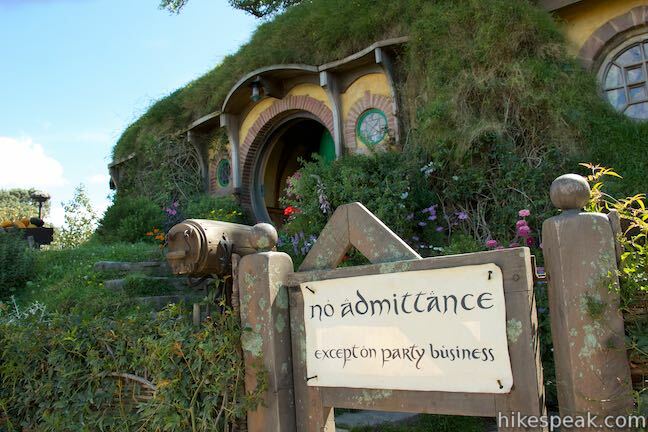 The gate still bears a sign reading, “No admittance except on party business.” If you knocked on the door, you might even hear Bilbo shout, “We don’t want any more visitors, well-wishers, or distant relations” …or maybe it would be your guide telling you to rejoin the rest of the tour. 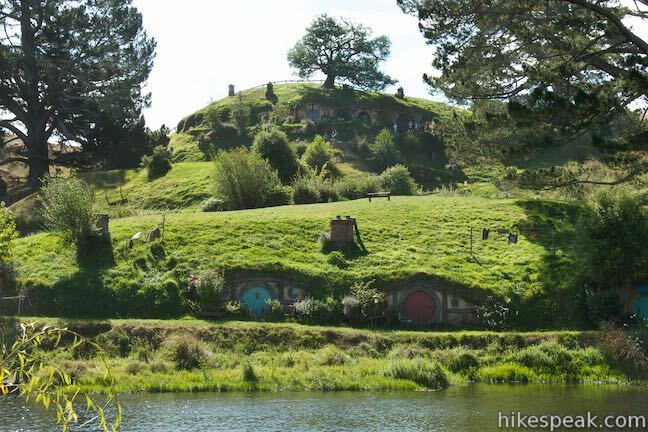 From Bag End, head downhill past more hobbit holes, including the home of Samwise Gamgee, the faithful sidekick to Frodo Baggins. 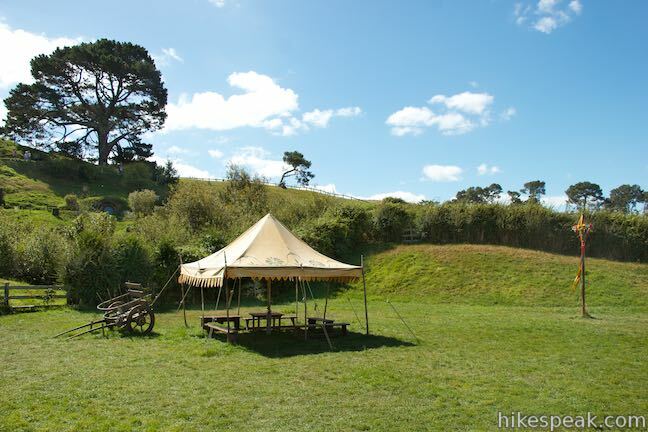 Below the hillside, you will arrive at the celebratory grounds of Bilbo’s 111st birthday party. An event tent has been left behind from the party. 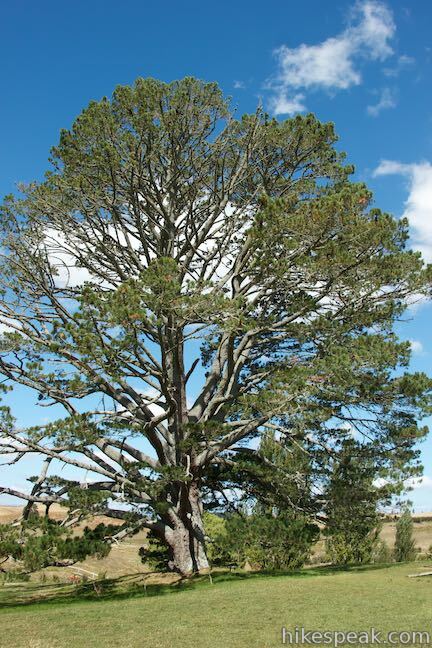 The tall tree standing next to the pond is called the Birthday Tree. Locations scouts were initially drawn to this area because of the tree, but when this spot was selected as the site of the birthday party, it was decided that the surroundings were perfect for the rest of Hobbiton as well. With the help of the ring, Bilbo vanished in front of his guests at his eleventy-first birthday. 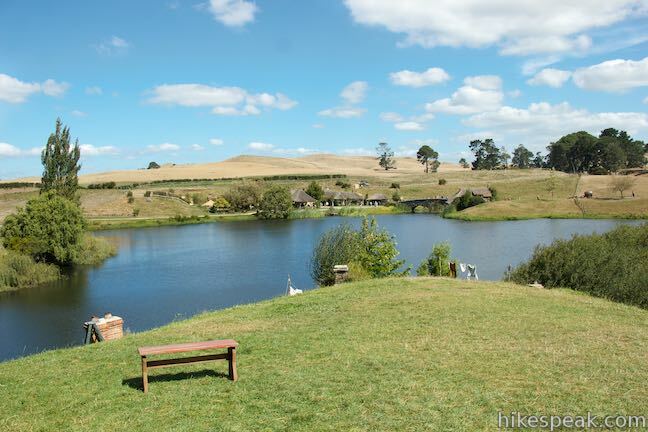 You don’t have to disappear from Hobbiton quite yet. Relax in the grass and enjoy a few minutes of laziness (as the hobbits would have) before continuing with the tour. 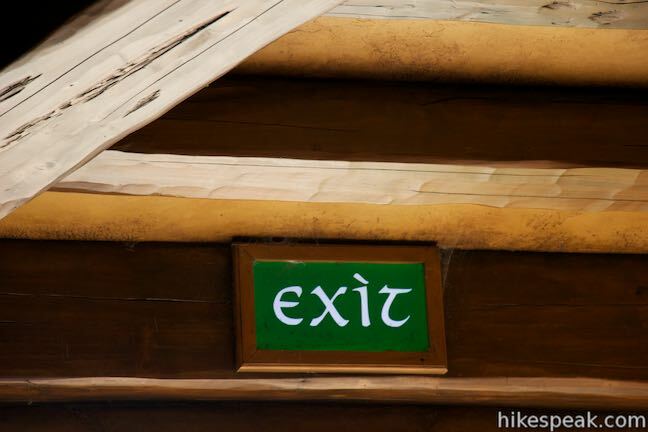 Follow a path around the pond to the Green Dragon Inn. Pass the Old Mill, which has a mill wheel by the water and cross a stone bridge to reach the large tavern. Gandalf comes over this bridge before reaching Gandalf’s Cutting in The Fellowship of the Ring. 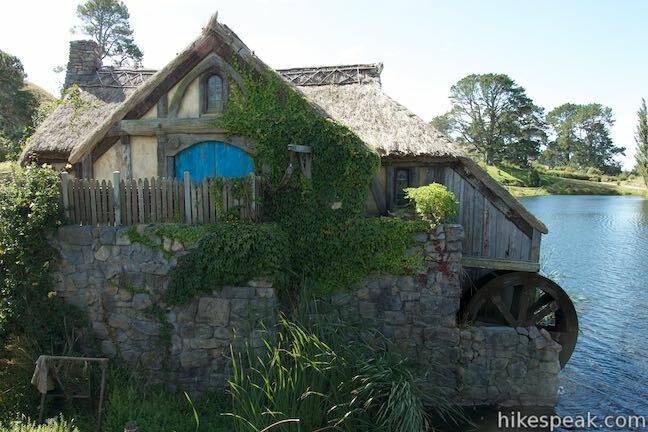 Built for Hobbiton visitors, the Green Dragon is a perfect replica of the Green Dragon seen onscreen. 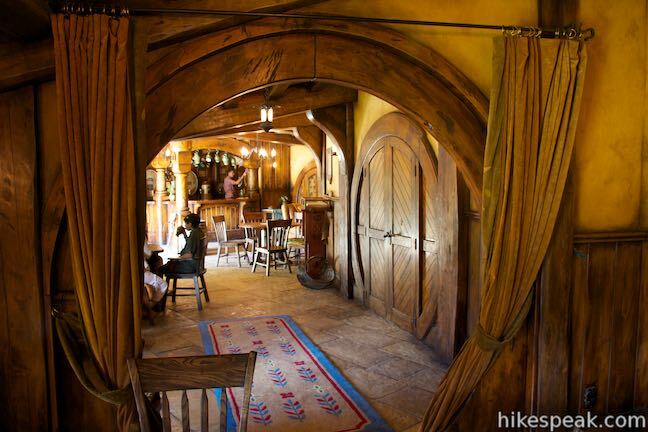 The only thing that’s missing is a couple barefoot hobbits dancing on tabletops. 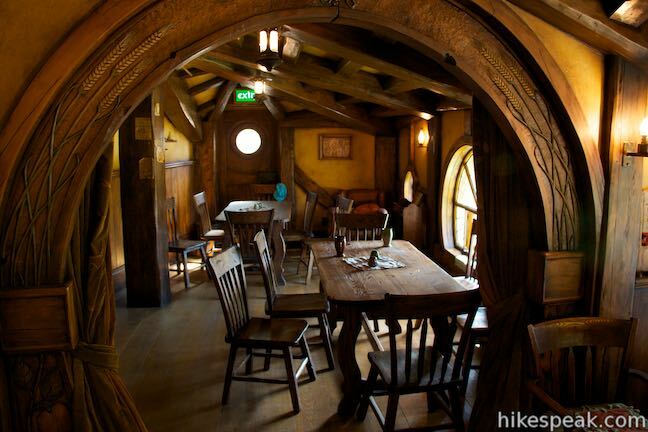 The level of detail in the recreation is incredible and the Green Dragon is a great place to have a drink, sitting in front of the fireplace or at a big wooden table in front of one of the round windows. In a delightful career change, your guide suddenly becomes your bartender offering a pint of the finest brew in the Southfarthing (included in the price of the tour). 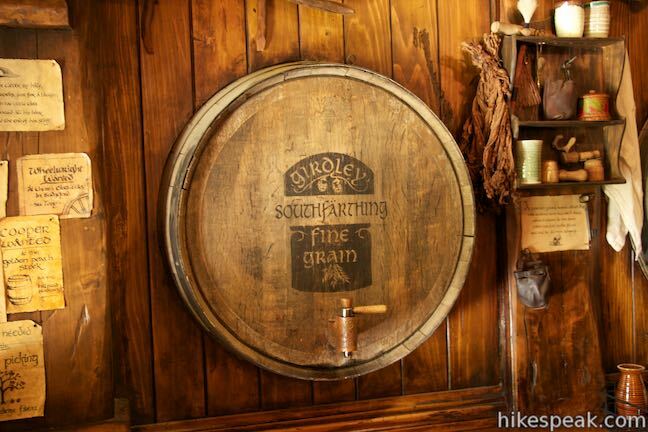 Sit back with a ceramic mug full of ale, cider, or gingerbeer brewed specially for Hobbiton for a local brewery. 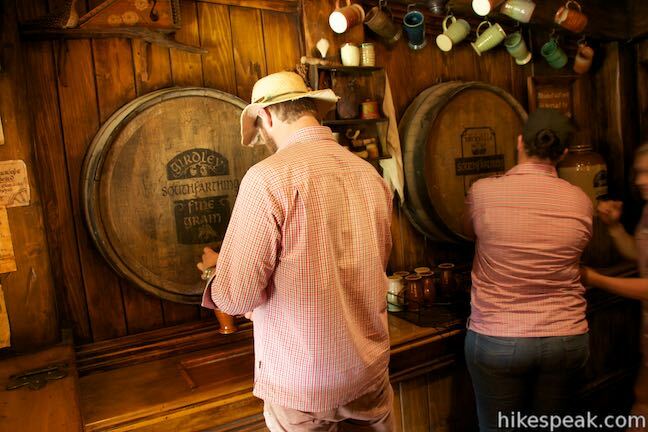 Ciders are quite popular in New Zealand. If you get a stout and a cider, you can mix them together for a delicious drink we’re calling a Shire Snakebite. 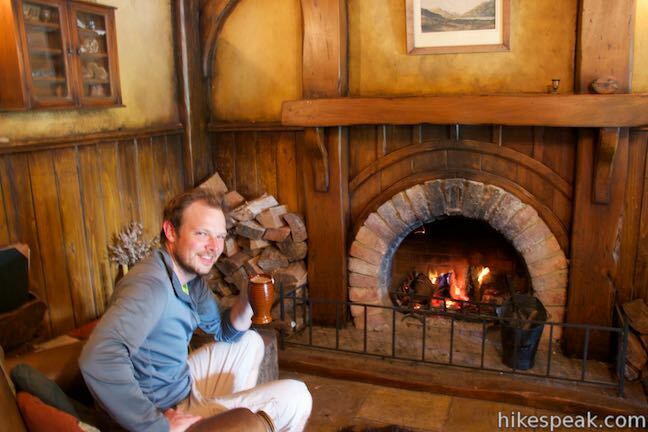 Cling your pints together and cheers the life of the hobbits. No doubt, you’ll wish you could stay for a few rounds, but before you’re ready, your guide will tell you that it’s time to leave. 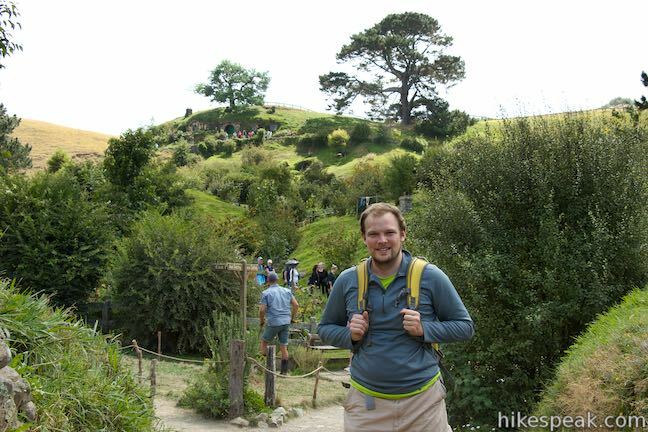 Steps outside the Green Dragon and walk back through Hobbiton to get on the bus. 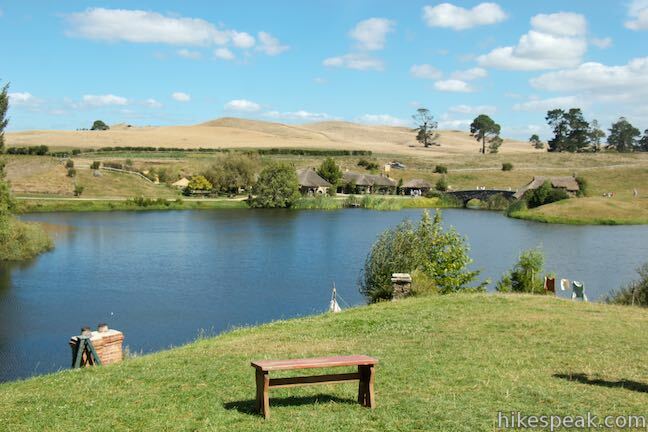 A final view of Bag End and the Party Tree on the other side of the pond gives you a good lingering image of Hobbiton. 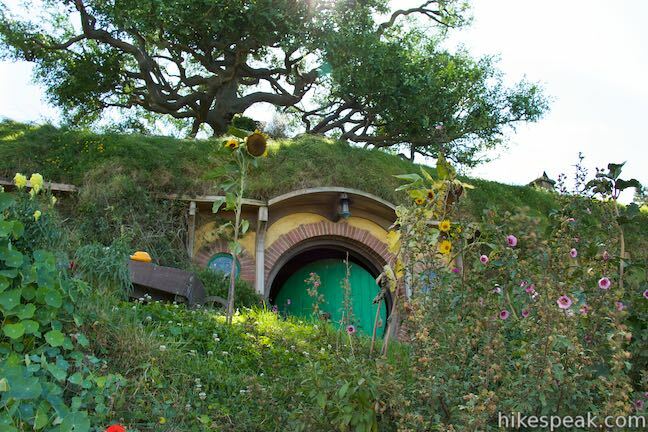 Make your way past more hobbit holes to reach the bus stop. Like clockwork, a bus will be there to pick you up and bring you back to Shire’s Rest to conclude your tour. 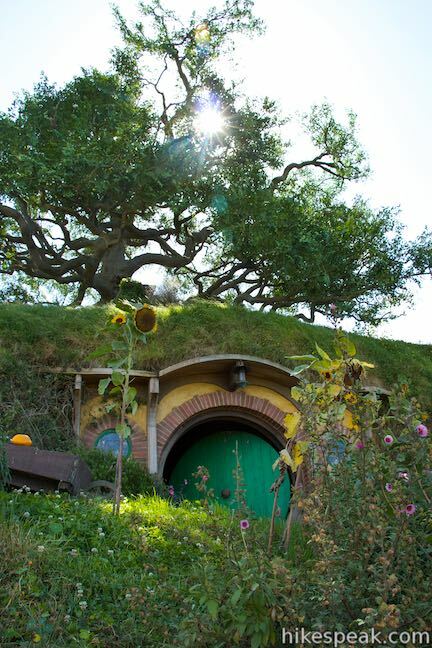 A tip for photographers: Bag End is backlit in the afternoon, so try to get a morning tour for a front-lit view. 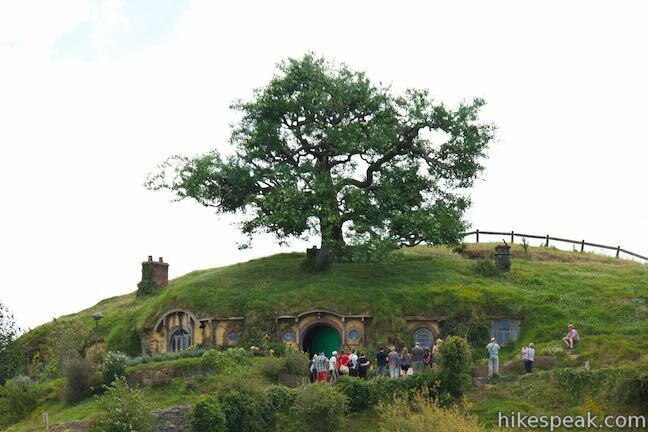 If you can, take the day’s first tour of the day, so you can see the shire with fewer tour groups walking around. 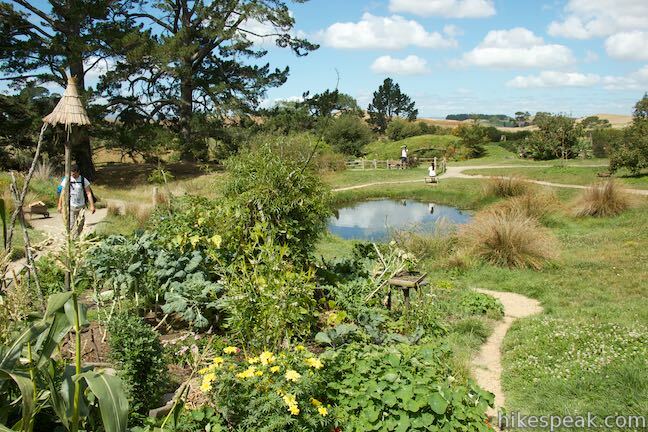 Tours depart from Shire’s Rest (501 Buckland Road in Matamata) every 30 minutes from 9:30 a.m. until between 3 p.m. and 5:30 p.m. depending on the season. Tours last about two hours. 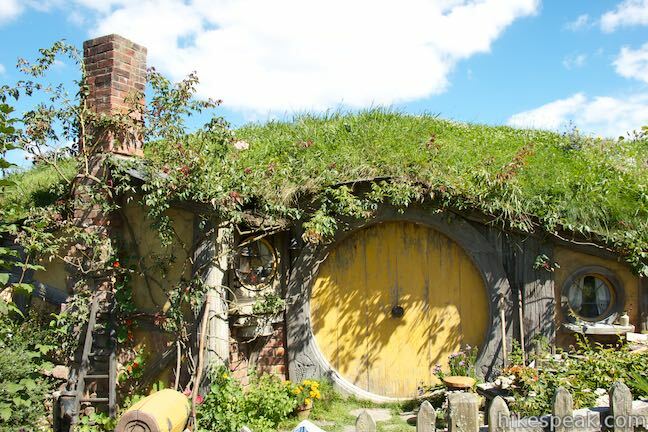 If you don’t have transportation to Shire’s Rest, it is also possible to book a tour leaving from the i-SITE Visitor Center in Matamata and from other cities on the North Island like Rotorua. 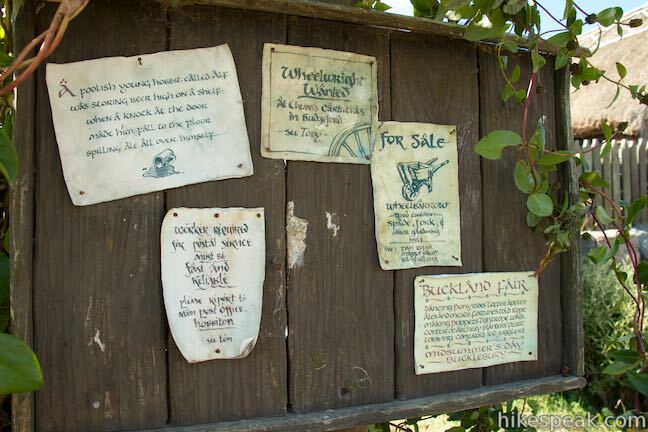 Visit hobbitontours.com for pricing information and to reserve tickets for a visit to Hobbiton. Directions: From Hamilton, take State Highway 1 southeast toward Cambridge. After 35 kilometers, turn left on Karapiro Road. Drive 3.8 kilometers, bear left onto Buckland Road, and drive another 12 kilometers to Shire’s Rest. From Rotorua take State Highway 5 northwest for some 40 kilometers. Turn right on State Highway 28, following signs for Matamata. Drive 10.7 kilometers and turn left on Te Poi Road. 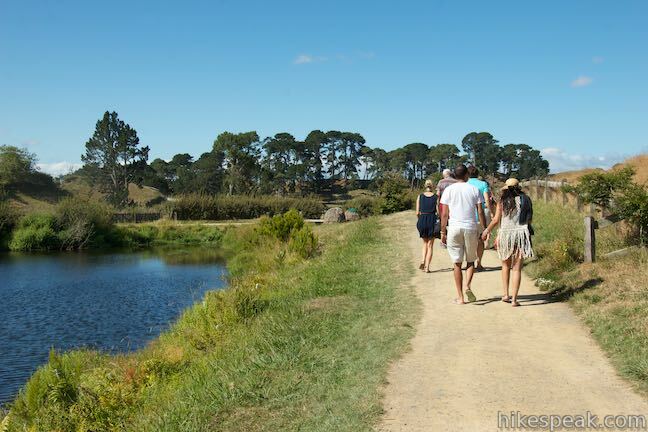 Drive under 4 kilometers to the small center of Te Poi and turn left on State Highway 29. 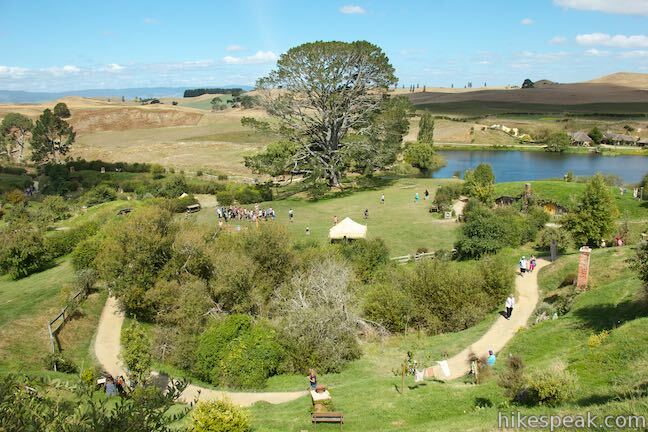 Travel another 10.6 kilometers and turn right, following signs for Hobbiton. This is an odd intersection in which you’ll be on Hopkins Road for 60 meters and make an immediate left onto Puketutu Road. Go 1.3 kilometers, turn left on Buckland Road, and drive the final 5 kilometers to Shire’s Rest. 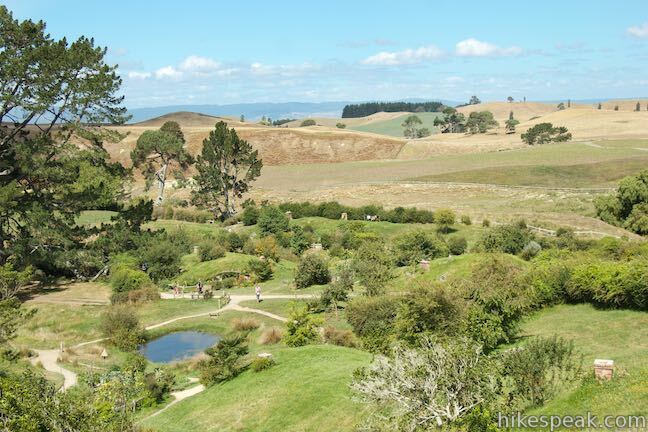 This 8-kilometer return trek in Kakepuku Mountain Historic Reserve near Te Awamutu ascends to a 449-meter summit with a lookout tower boasting panoramic views. This lodge near Lake Taupo blends comfort with luxury and has welcoming owners who can help you take advantage of the area’s abundant outdoor opportunities. 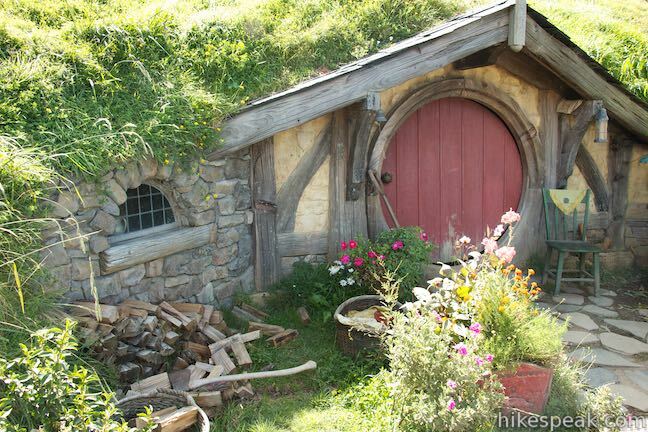 Is Hobbiton wheelchair accessible? I have lots of “pushers” and can walk short distances. do u have a cheaper price for super gold card holders nz seniors. can u go in by yourself.